I’m absolutely in love with our new apartment! It’s been two months now since we moved in and I couldn’t be happier. There is a lot of natural light, the floor plan is very big, and the views are great – these are all things that are extremely rare to find in some of the new apartments going up in Docklands. A challenge faced when moving is how to decorate the new space. I spend a lot of time working from home, so I need to make sure my space feels good and enticing to allow me to be productive. 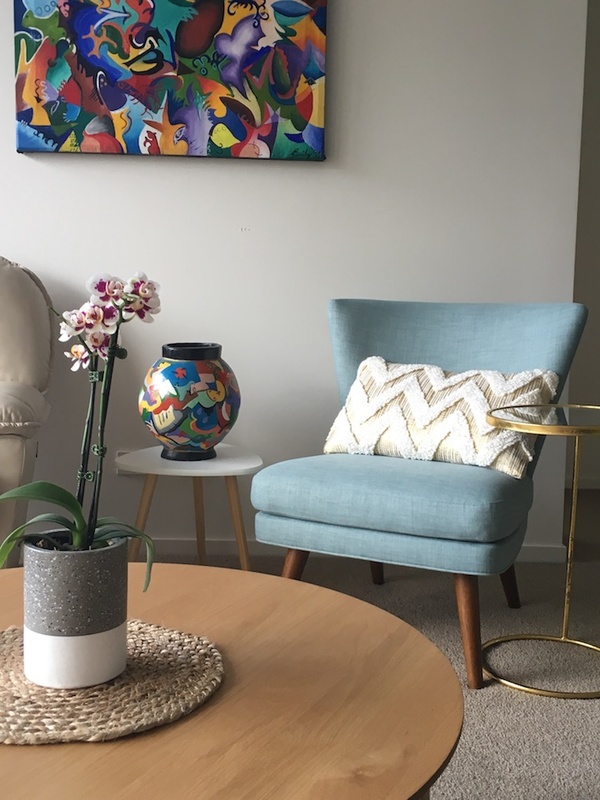 The idea of getting someone in to help decorate crossed my mind and after Googling ‘affordable interior decorators’ I discovered that Freedom offers an affordable interior design service. For only $150 one of their interior designers visit your home to see what help you need with your decorating. Wow – what a cool service! My first thought was why on earth are other furniture companies not offering something as valuable as this to their customers? I contacted Freedom to find out more about their interior decorating service and within a week one of their decorators named Sarah visited our apartment. During this one-hour consult, she took photos and measurements and listened to what I wanted to achieve with our new space. She also took time out to look at my Pinterest Home Décor inspiration board to get a sense of the style I liked. The discovery session was valuable, and I felt she understood exactly what we were after – she also offered some incredible decorating tips on how we could use the space better. After a week Sarah invited me in store to view what she has designed for our space on her Freedom virtual decorating 3D program. It was great to see that she had included some of our existing furniture (such as our L-shaped grey sofa) as well as my paintings when planning out the layout of each room. With her help, we were able to decorate two room, the living, dining, and outdoor balcony area. I appreciated the fact that I was not pressured to buy any Freedom pieces, in fact, we openly discussed the fact that I would be looking elsewhere for more affordable pieces as there was no way I would be able to decorate the entire place with just Freedom furniture. Below are some of the stand-out pieces we purchased. As you can see from these pieces below, we have opted for a light, very trendy Danish Retro Scandinavian feel. Using light coloured woods, whites and pops of colour. I never thought of getting an oval-shaped table. 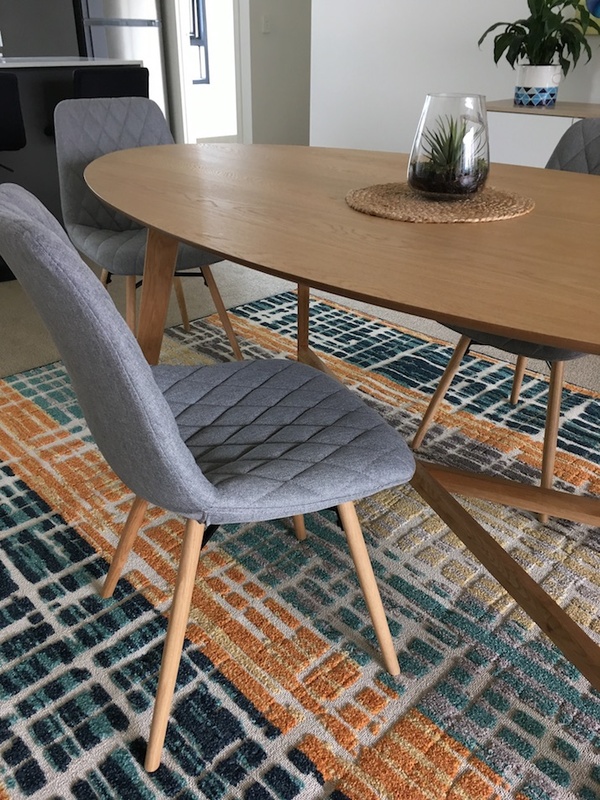 But the oval shape is a lot more interesting than a round or square table, it also adds a touch of softness to the dining room are, making it really cosy. Sarah also suggested putting a rug underneath the table to make it stand out more from the neutrally coloured carpet. 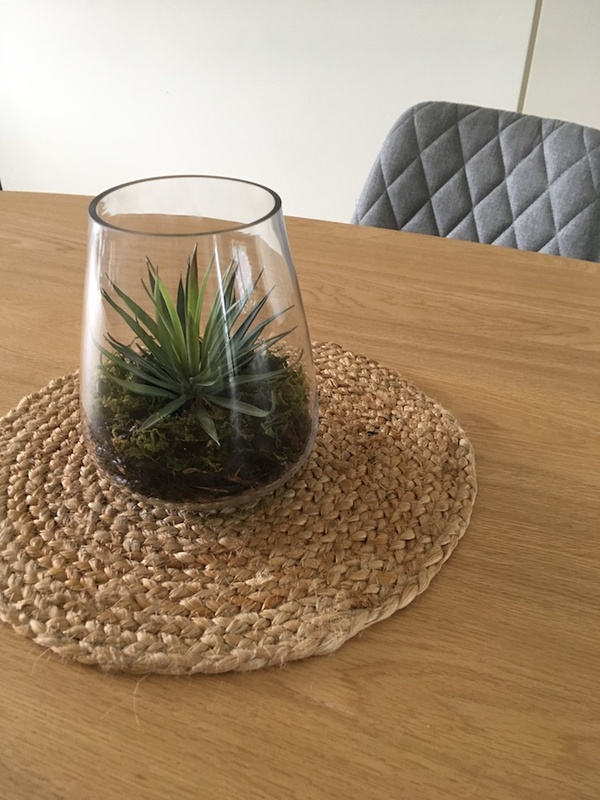 I added this really cool succulent terrarium and jute placemat to add even more interest and decorate the table. 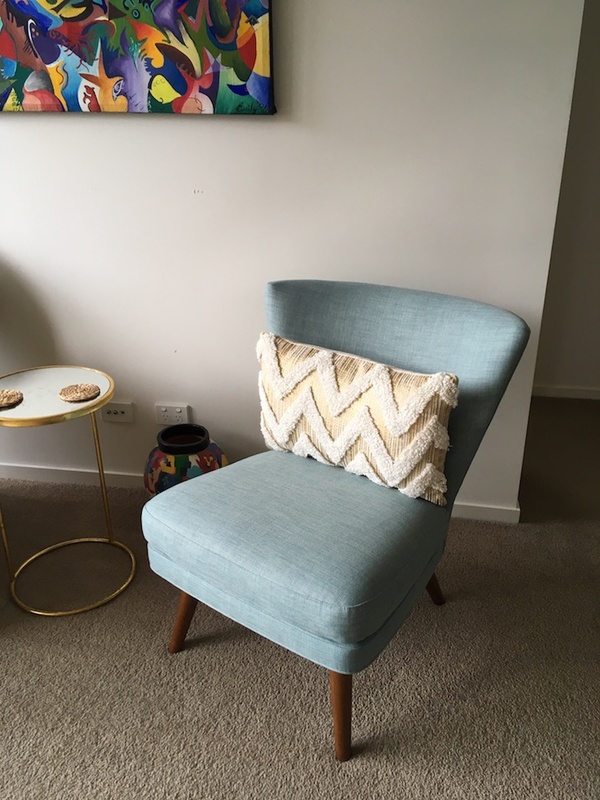 Sarah’s advice was to have a feature chair with no arms to not only open the space but to match the painting I painted that I wanted to use on the wall behind it. We added a gorgeous gold textured pillow from Adairs to complete the look. 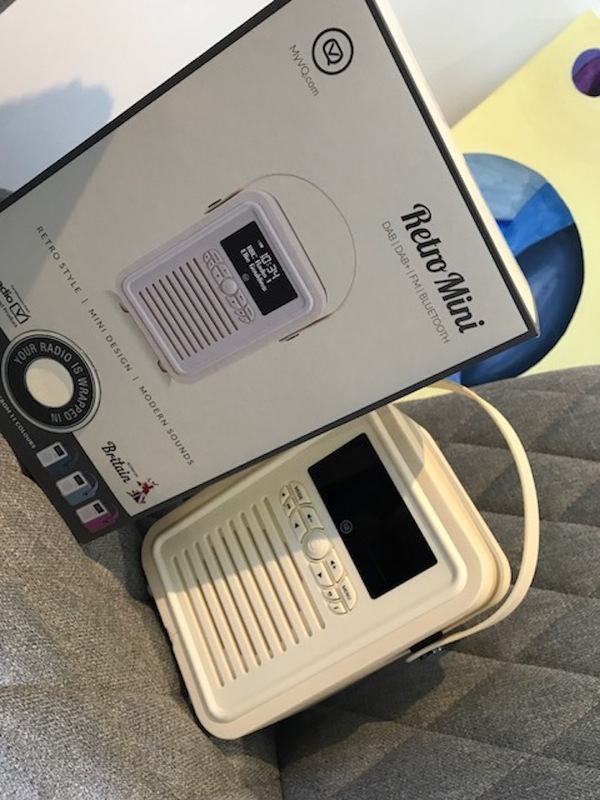 This radio (is not only lovely to look at) it’s also really easy to use. It’s a great addition to our Danish retro looking living room and it sits nicely on top of our new white and oak buffet unit. We use it all the time, especially when playing background music when cooking on the Thermomix or doing some work. Available in different colours, it’s a great addition to anyone looking for something different to use to decorate their space. 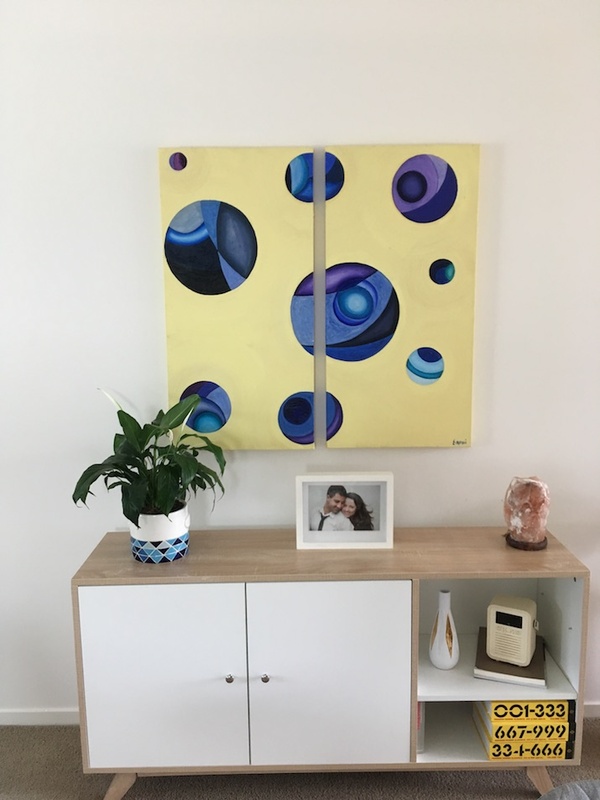 Seen here is a White and Blue Abstract Pot from Bunnings, Retro gold and white vase from Spoilt, Rock Salt Lamp and some of my Industrial Design books and my large abstract Blue Balls painting which I painted in 2005.